Home › Joint Support Ship › Joint Support Ship RNLN “HNLM Karel Doorman"
Dutch Defence Minister Jeanine Hennis-Plasschaert ceremonially named the Karel Doorman, the new Joint Support Ship for the Royal Netherlands Navy. 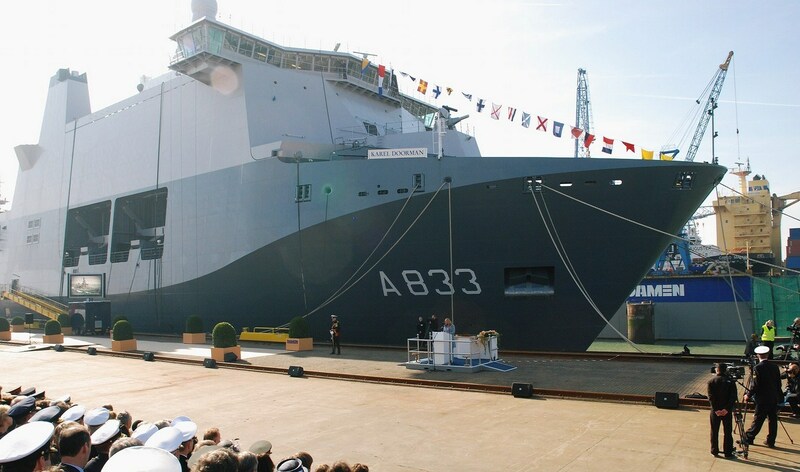 The ceremony took place in Vlissingen at the shipyard operated by Damen Schelde Naval Shipbuilding. With a length of 204.7 metres, the Karel Doorman is the biggest ship in the Dutch navy.